After attending the workshop about specialist medicine & case management this morning we can conclude saying that the right values for a patient centered attention in medical tourism are: universality + access + good quality + care + equity + solidarity. This combined with good marketing solutions such as a web marketing strategy, powerful partners, a strong Doctors network, media advertising and the power of worth of mouth are key factors to succeed within the medical travel sector. The European Medical Travel Conference 2011 starts today in Barcelona. ETMC aims to connect people to global health solutions. 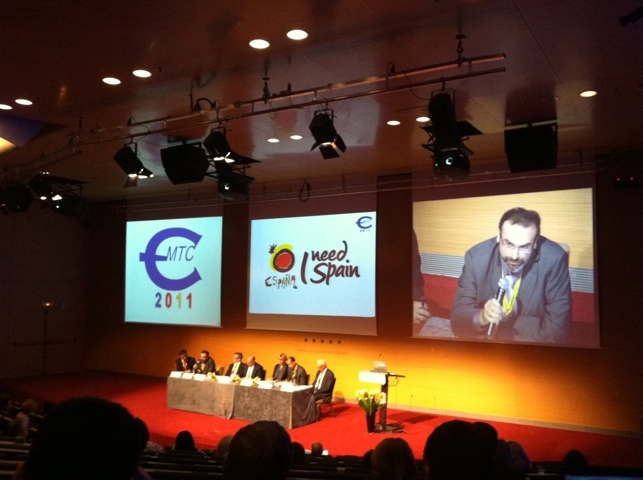 Ideas, lectures, innovation, discussion, negotiation, partnerships: EMTC2011 is the platform that helps ideas come alive to help the innovation and growth of the medical tourism industry. The website (www.emtc2011.com) informs about all relevant parts of the event and the organizers can be contacted directly at +49 89 1011 9222 anytime or by mail to info@emtc2011.com. n this first part of a three-part series on incorporating family into the patient room, authors Hannah Jefferies and Jennifer Merchant of Perkins+Will discuss the core concepts of the model and introduce a project at Rush University Medical Center, where that model was used. “One of the key things that one realizes in training is that we very often treat whole family units. When you are treating persons who have elements of frailty, their loved ones become all the more critical to their care and to plans that help move patients toward better health. Thus supporting families/loved ones to feel at place in the clinical environments helps develop better plans that have more chance of successful implementation with our patients,” according to Dr. Anthony J. Perry, MD, clinical transformation officer at Rush University Medical Center in Chicago. La comunicación es la herramienta base de cualquier relación, personal o profesional. Si no somos capaces de comunicarnos, no podremos transmitir nuestros conocimientos ni nuestras inquietudes. En el ámbito de la Salud ocurre lo mismo. Sulmasy, fraile franciscano, internista y miembro de la Comisión Presidencial para el Estudio de las cuestiones de bioética del presidente Obama, afirma que “no importa cuan sofisticada sea la tecnología de salud recibida, la salud se alivia con tres simples elementos humanos: compasión, contacto y conversación”. En la vocación del profesional sanitario está presente el objetivo de curar y lograr conductas más saludables, desde la perspectiva de los servicios humanitarios, más allá del valor retributivo que puedan tener sus acciones. Pero para curar hay que tratar, ¿y cómo se ha de tratar para conseguir, que desde una comunicación eficaz, se puedan adquirir o modificar hábitos? No comunicamos sólo con palabras. El tono de nuestra voz, nuestra postura corporal, la mirada, la disposición del espacio, la distancia entre nuestro interlocutor y nosotros, nuestros gestos, incluso nuestra ropa, todo puede ser una herramienta de comunicación eficaz o, por el contrario, una barrera. No matter who you talk to in Memphis, Tennessee, chances are their life or a family member’s life has been touched by Le Bonheur Children’s Hospital. Founded in the 1950s, it was the result of the initiative of a group of women who advocated for children to have a special place to receive medical care. The children’s hospital’s mission is to accept any child in the community who needs treatment, regardless of their family’s financial status. With a new $340-million replacement hospital planned, a broad fundraising effort was initiated in Memphis. To date, nearly $105 million has been raised, making the Le Bonheur campaign the largest in the city’s history. Contributions came from all constituencies, including young children who donated pennies through their schools to corporations, which in turn made large contributions to the campaign. Yet it is important to keep in mind that Le Bonheur’s reach goes well beyond the Mid-South region. Every year, more than 135,000 children from all 50 states and throughout the world are treated there. The new Le Bonheur Children’s Hospital will take the organization well into the 21st century. The 12-story, 613,000-square-foot, state-of-the-art facility includes 255 hospital beds with dedicated units for pediatric intensive care and cardiovascular intensive care. It also has 60 neonatal intensive care private rooms, including several rooms for twins or triplets.